It’s an interview with Linda Garland, the founder of the Environmental Bamboo Foundation (EBF). EBF is a non-profit organisation based in Bali dedicated to promoting bamboo as the ideal solution to the twin problems of over-population and dwindling resources. The video is only 3 minutes long, and well worth a look. Check out the embedded video above! I previously wrote about the 1,000 uses of bamboo. Now, I haven’t actually clicked through the entire gallery, but I’m pretty sure it includes bamboo scaffolding. Bamboo scaffolding is a peculiarly Asian application, seen most commonly in Hong Kong, China, and India. It’s also a staple of Jackie Chan’s Hong Kong movies, the scene of many amazingly choreographed fight sequences. In Singapore, we don’t use them anymore. Instead, metal scaffolding wraps around the sides of a building in progress. How is that better than bamboo scaffolding, which combines strength and flexibility in one economical package? More photos available here and here. We always say that bamboo is one of the world’s most versatile building materials. Now someone has gone and proven it by coming up with a list of 1,000 things made of bamboo. On the BambusCentraum Deustchland web site, you can view all sorts of wonderful and fascinating bamboo creations. The text is in German, but don’t worry, you can just admire the photos. Other than the hugely popular bamboo flooring and mats, there’re also unique products like bamboo hammocks and even beer brewed from bamboo! Just keep hitting the refresh button to see the next item. It’s like what Forrest Gump said – you never know what you’re gonna get. Can bamboo be certified organic? I came across bamboo kitchen utensils that are “made from 100% organically grown bamboo”. That got me intrigued because I’ve not heard such a claim before. I’m not doubting the authenticity of this manufacturer, but it got me thinking: Can bamboo be certified organic? Well, what does it mean to be organic? The vast majority of bamboo products originate from China and they are not organic – there’s too much paper work to be done. At the most, we could call it “free of fertilizers and chemicals”. Which is not such a big deal now because many bamboo forests currently don’t require chemicals. But as increasing demand puts pressure on the supply, more and more companies may be tempted to resort to artificial means of speeding up the growth even more. Bamboo produces 13 tonnes of wood an acre, as against seven for lob lolly pine, a major source of timber in the US. Bamboo can store “four times the carbon dioxide of a stand of trees of similar size. And it releases 35 percent more oxygen. I can’t think of any plant that’s greener than this. Bamboo is one of the fastest growing plants in the world, taking just 4-6 years to mature for use in bamboo flooring. After harvesting, the new shoots grow up from the underground clumps without any replanting needed. Even so, the booming market for bamboo products has caused severe pressure on the supply. The forest that we harvest from is monitored by the local government to ensure that there is no over-harvesting. This restricts the supply even more. You might think replanting new forests would be a cinch. Ironically, it turns out that bamboo is one of the hardest plants to grow from seeds, because they flower only every 60 to 120 years before dying. The race is on to find the fastest and most cost-effective way to reproduce bamboo from tissue cultures. This would allow much faster replanting. Hopefully that would help ease the supply crunch and lower the costs for manufacturers. People know Star Bamboo for our eco-friendly bamboo flooring, but we also offer other bamboo products. One of our most popular and versatile products is bamboo veneer. Bamboo veneer are thin sheets of bamboo material, with a frieze cotton backing to minimise breakage. They typically come in 4′ by 8′ sheets of 0.6mm thickness, and are made by thinly slicing big blocks of bamboo material. The beauty of bamboo veneer is its flexibility. Our bamboo material, like that of bamboo flooring, is very hard and strong. But this strength can be a double-edged sword, making it difficult to mould and press. Bamboo veneer, on the other hand, is so flexible that it can be used to wrap curved surfaces. The most popular application of bamboo veneer is on kitchen and bedroom cabinets. But it can be so much more than that. Bamboo is a beautiful sustainable material. It’s strong, durable and extremely fast growing. Did you know that some species of bamboo have been known to grow an astonishing 1 metre in a single day? No wonder companies have been making all sorts of products from it for years, from flooring to chopping boards and other household items. Star Bamboo was one of the first companies to make furniture out of the bamboo material. But it’s a matter of time before other companies caught on to this. Something to brighten up your week. But seriously, I have received queries from concerned customers wondering if our bamboo flooring enterprise is depriving those endangered pandas of their food source. The short answer is, No. We use a different species of bamboo from what pandas eat. Lucy Siegle of The Observer asked a slightly different question: Will the focus on commercially viable species of bamboo result in monoculture, and lead to the extinction of the other species, including the ones that pandas depend on for sustenance? She’s right to point out that making a product out of bamboo, however renewable and fast-growing it may be, does not automatically qualify it as an eco-friendly product. The source of the bamboo is just as crucial. Star Bamboo only uses bamboo material that has been certified by the local Shaowu government. It has a programme in place to manage the harvesting of bamboo in the region. It is also important to note that the species of bamboo we use, commonly known as Moso, is native to the region. It was not a species imported for commercial reasons. Material scientists also question the way bamboo is processed, predominantly in China, using elemental chlorine (which produces toxic dioxins) and where there are little to no standards or controls governing air emissions and liquid effluents. Well, we don’t use a chemical as toxic and difficult to handle as chlorine in our production. Instead, hydrogen peroxide is our preferred choice. It achieves a good bleaching effect for our Natural bamboo flooring, and the by-products are only oxygen and water. It is costly too, which explains why Natural bamboo flooring is generally priced higher than Carbonised bamboo flooring. So back to the question, do bamboo flooring manufacturers steal food from pandas? The long answer is, it depends on the practices and ethics of the manufacturer. So please purchase only from responsible manufacturers, and market forces will ensure that the pandas do not go hungry. 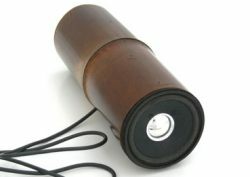 I came across bamboo speakers by a Japanese designer Fumi Masuda this morning while having my daily dose of green blogs. Sounds like a good idea. 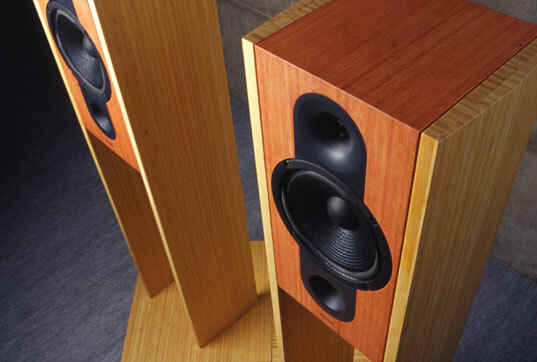 When friends heard I was in the bamboo flooring line in 2001, a few of them audiophiles came asking for bamboo speakers and LP turntables to be fabricated. Now, I’m not sure whether there’re any actual audio benefits to using bamboo. 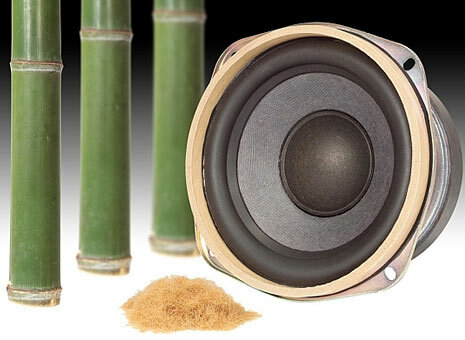 The high density and strength of bamboo could dampen vibrations and contribute to a purer sound. Well, our company was (and still is) focused on producing flooring and never got around to this little project. I did a Google search and it turns out that Fumi Masuda wasn’t the first. But there are some interesting differences among them. I don’t know how commercially successful the above products will be, but it’s certainly a great showcase of the versatility of bamboo.